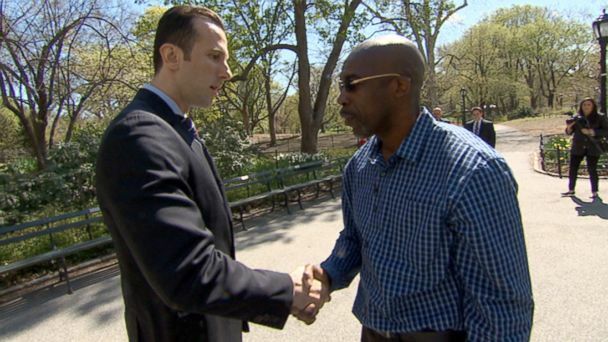 When Alex Sutaru heard the story of Jonathan Fleming, a Brooklyn man exonerated after doing nearly 25 years in a New York prison for a murder he didn't commit, he knew he had to act. "This is somebody that wasn't guilty of a crime; he was wrongfully convicted," Sutaru said. "After the hell he's been through for the past 24 years he came out with a positive attitude and said he wants to live the rest of his life, go to school, be positive and today's the first day of the rest of my life." Fleming had been freed three weeks ago by a key piece of evidence - a phone receipt in the case files all along that put him at Walt Disney World with his children when the murder was committed in New York. Though his release was astounding and a long time coming, Fleming was returned with no home, no job and no money. "I had about $93 in my account so that's all I was given when I got out of prison, $93," Fleming said. "I'm living from house to house with my cousins." Amazingly, even after all of the hardship he endured, he expressed not one ounce of resentment. After being asked how he could not be angry after such an ordeal, Fleming said, "I just have to move forward. I'm just so happy to be out and I don't want to live that way." So Sutaru, a 32-year-old Wall Street banker, moved by Fleming's demeanor and his story, went online and created a fundraising campaign. Within days the campaign raised nearly $35,000 from more than 600 people in 14 countries. The money will help Fleming afford a place to live and food to eat as well as get him on his feet while he looks for a job. "I think people recognize that donating a little they can help this person integrate back into society and build a life for himself that was wrongly taken away from him," he said. "People are good. There is some bad out there but most people are good." On Monday, Fleming and Sutaru met for the first time. "I want to thank you, man, I really do, I want you to know that, it really means a lot that you did this for me," Fleming said. "You're a wonderful man to do this for me. I appreciate it." "People, you know, I never thought they'd do this for me," he told ABC News. "I look at things really different now, I really do, I look at things real different."